Crooked Dice gives us another in their 7TV series with Rogue's Gallery. Expand your game! 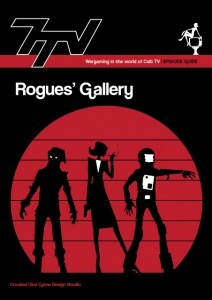 Rogues' Gallery is a new 7TV supplement and is available from the CD web store right now. 30 tremendous PDF pages expanded from our Salute 2012 quick play games. 3 episodes of 7TV with Department X, the Time Lift Security and The Beat against all manner of devious opponents. Everything you need (apart from the Rules) – maps, full cast lists, plus TV listings, script extracts and photos from the Salute games. All for £4. Fiddler's Green: Hugo Soloman needs to make a call! Scares in England's green and pleasant lanes. The Mist From Mars: Time Lift Security defend against an alien invader hitch-hiking a space capsule. Canning Town Collar: DC Frank Skelton aims to nab the slippery Duchess down the docks. Shift it! Play Unplugged Review - Lacuna Part 1.